The Birmingham Rose Society is proud to present its annual Rose Show on Mother's day weekend at the beautiful Birmingham Botanical Gardens. This show is one of the largest horticultural shows in the southeast typically showcasing 400 roses on display along with beautiful artistic arrangements and stunning photography featuring the Rose! The judging is Saturday morning, but the festivities are all weekend. Think You Can't Show Roses? There are all sorts of categories ranging from "novice" to "experienced exhibitor" and also "artistic arrangements" and photography! If you grow roses, then you can show roses! You do not have to be a member of the society to enter a rose in the show. 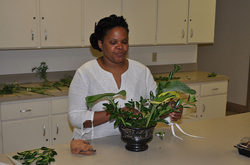 We encourage EVERYONE to come and experience the Birmingham Rose Show! Consulting Rosarian's donate their time to answer questions about growing roses and are available to speak at garden clubs. 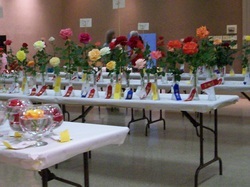 Our Certified Horticultural & Arrangement Judges travel at their own expense to judge other rose shows. Look for us at local farm and flower markets in the Birmingham area.